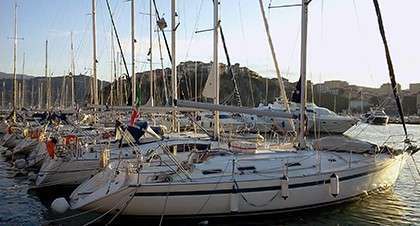 Prices in EUR of our sailing charter pricelist are per week. Prices quoted are for a minimum of 5 persons. 10% discount in the period from Monday to Friday. We also organize tours with a minimum of two people with prices to be agreed. Discounts for groups over 5 participants. Possibility of lunch on board with an extra of ? 15,00 per person. Overnight in double cabin (double or bunk bed), pillowcases, bed sheets and towel set, tender and outboard engine, GPS, RC and KASKO insurance, moorings in the port of embarkation and disembarkation, final cleaning, CNI Basic group of Agropoli membership association. Skipper and fuel (? 125,00 per person for the entire week to be paid at embarkation), galley and any moorings (payable on board with the common fund managed directly by the crew, skipper excluded), any visits. All that is not included in “the price includes”. Increase of 50% for a single cabin. Language course with mother tongue teacher and teaching materials, certificate of attendance, 7 nights in a double cabin (double or bunk bed), skipper, fuel, final cleaning, linen, tender and outboard engine, GPS, RC and KASKO insurance, moorings in the port of embarkation and disembarkation, CNI Basic group of Agropoli membership association. Galley and any moorings to be paid on board with the common fund managed directly by the crew, any visits. All that is not included in “the price includes”. (*) Starting with a minimum of 5 persons.